The late rapper's official Instagram account announced that a memorial service will be held for him Thursday at the Staples Center in Los Angeles. The posting included a photo of Nipsey, dressed in white and wearing angel's wings. 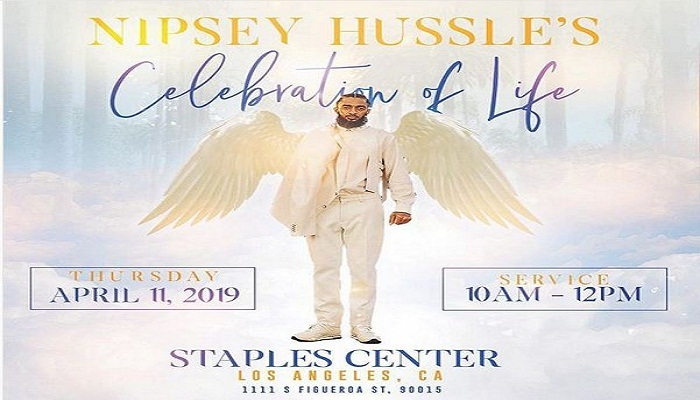 "Join Us for the Celebration of the Life & Legacy of Nipsey Hussle Thursday, April 11th 2019 - Staples Center, the caption read. "For free tickets & additional info please visit: Staplescenter.com/NipseyHussle." Nipsey was gunned down March 31 in Los Angeles near a clothing store he owned. Eric Holder, the suspect in the shooting, has pleaded not guilty to one charge of murder and two counts of attempted murder. The 29-year-old was also charged at his arraignment with possession of a firearm by a felon. Nipsey was beloved not only for his Grammy-nominated music but also for his activism and entrepreneurship dedicated to uplifting his community. For that reason, a scramble for tickets is expected to his memorial at the Staples Center, which seats 21,000. According to the venue, tickets will be available to Californian residents only starting at 10 a.m. Tuesday via axs.com. There is a four-ticket limit per household, and the tickets will be provided via Flash/AXS mobile delivery only. Tickets are not eligible for resale and are nontransferrable. Doors will open at 8 a.m. the day of the memorial, and attendees are encouraged to arrive early because of expected traffic. Those attending will be subject to a metal detector screening, visual inspection and bag inspection. No backpacks or bags larger than 14 inches by 14 inches x 6 inches will be permitted. Cameras and recording devices will not be allowed out of respect for the family. Information will be released soon regarding the procession for those unable to obtain tickets.